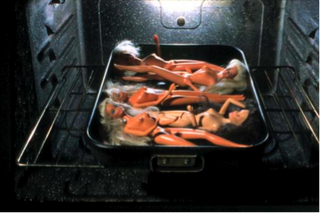 Photo: One of Tom Forsythe’s “Food Chain Barbie” pictures. Some copyright is a good thing. Too much copyright is a bad thing. Today’s topic comes from The Happytime Murders trailer, which was made by the company STX Films, who are now being sued by Sesame Workshop over the phrase “No Sesame, All Street” used in the trailer. First, let me point out: I don’t think the trailer looks that funny. I probably won’t see it. I definitely think that the phrase “No Sesame, All Street” is stupid and shouldn’t have been used. That being stated: STX Films has every right to use that phrase and I will fight for their right to use it. We take no issue with the creative freedom of the filmmakers and their right to make and promote this movie, rather this is about how our name is being misused to market a film with which we have no association. So their issue isn’t the “creative freedom” of the filmmakers in making the film, but rather the marketing of the film and the use of the words “Sesame Street.” The potential issues are two-fold: those words are explicitly copyrighted and trademarked to the Sesame Workshop and Sesame Workshop doesn’t want anyone confused about their involvement (or lack thereof) in The Happytime Murders. There are, however, several issues with this. As any person familiar with copyright law will tell you, there are loads of exceptions to copyrights. This are called fair use. And yes, there is also a version of trademark law called fair use, too, although it’s slightly different. But let’s look at them both. First: what we are defending is not The Happytime Murders. The movie, as Sesame Workshop stated, is not under attack — it is only the advertising and, in fact, only the one line (“No Sesame, All Street”) that is under attack. I’m assuming that Sesame Workshop also doesn’t like the fact that the trailer says it’s from “The director of The Muppet Christmas Carol and Muppet Treasure Island,” but they can’t do anything about that because it’s absolutely true: the film is directed by Brian Henson who also directed those two films. So the only thing Sesame Workshop is attacking is “No Sesame, All Street.” A phrase that evokes Sesame Street, but doesn’t actually say those two words together. The best defense of this phrase is that it’s parodying Sesame Street. (Not the film itself — the phrase is parodying Sesame Street.) And parody is absolutely part of fair use. In 2004, a lawsuit was brought to the 9th Circuit Court — Mattel Inc v. Walking Mountain Productions. Mattel was trying to block a series of artistic photographics taken by photographer Tom Forsythe. They were of various Barbie dolls, all naked, being mutilated by various kitchen implements. It was called “Food Chain Barbie.” Hell, the name of the brand was part of the title. And Mattel lost. In fact, they were forced to pay $1.4 million to Forsythe in fees. Mattel, the company that has been making Barbie for 45 years, was, not surprisingly, displeased by these images and promptly sued, arguing that the public would mistake these exaggerated and suggestive images for authentic Mattel products, thus diluting or diminishing the commercial value of their property. But last week, artists everywhere had reason to celebrate when the U.S. 9th Circuit Court of Appeals ruled against Mattel, saying that Forsythe’s photographs were parodies of the iconic plastic doll and contained messages about gender roles and consumerism. As such, the photographs were legitimate free speech and did not infringe on Mattel’s copyright or trademark rights. And Sesame Workshop isn’t even trying to sue because of the movie itself — which you could argue may or may not be parody — but rather because of one line in the advertising, which STX Films could and should definitely declare as parody. “No Sesame, All Street” even sounds like it’s trying to parody Sesame Street (badly, but still). So now, let’s see what would happen if Sesame Workshop tried to sue them for trademark infringement — after all, the words “Sesame Street” aren’t just copyrighted, they are also trademarked. But that also brings up problems, namely the fact that the advertising never actually mentions Sesame Street. The phrase “No Sesame, All Street” is used, but that’s an oblique reference to Sesame Street. And oblique references are absolutely allowed under fair use. In any case, like I stated: some copyright is good, too much copyright is bad. With too much copyright, just using the term “superhero” can get you sued (yes: it’s trademarked by Marvel and DC — probably the only thing they own together). Disney has managed to keep their copyrights from falling into the public domain so much that even works that are now eighty years old are still not available in the public domain. In fact, you may have heard about the people who stated that they owned the copyright to Sherlock Holmes because a few of his stories were published within the eighty year mark — but the courts quietly stated that nope, Sherlock Holmes was public domain in the US. If they didn’t do that, it would mean you would have to pay an expensive licensing fee every time you wanted to use Sherlock Holmes in a story or book. Again: there is a reason that copyright laws have limits. Parody, satire, and homages are all a big part of that and corporations have tested the limits of what those parodies, satires, and homages can do. But in the end, parody, satire, and homage are necessary for societies — after all, parody and satire and homage are all part and parcel with free speech.